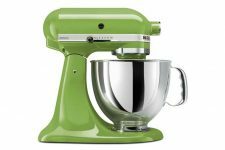 If after reviewing our Guide to the Best Stand Mixer for Your Kitchen you’ve decided to go with one of the KitchenAid models (excellent choice, by the way!) 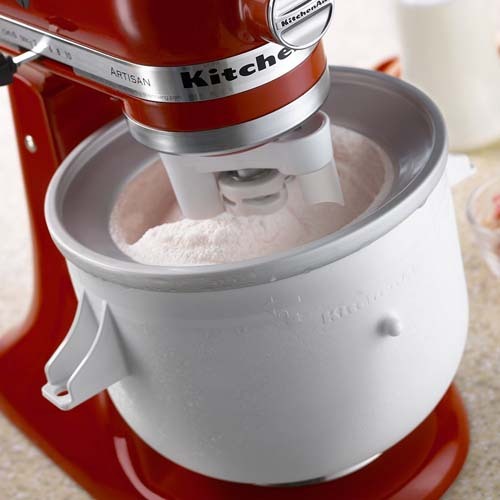 you should absolutely start exploring the many attachments offered by KitchenAid. One of the many benefits of going with this machine is the long line of accessories that significantly expand the capability of this one small appliance. Thanks to this purchase, you can do things like make homemade pasta, stuff sausage, or juice fruits and vegetables right from your home. 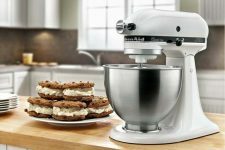 However, you may need some help in determining exactly which KitchenAid Stand Mixer Attachments are best for you. One of the attachments that caught my eye from the get-go is the ice cream maker. 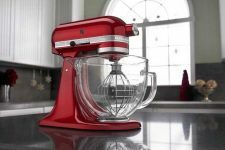 It will work for nearly all stand mixers, either tilt head or bowl lift, because it locks into place just like your regular mixing bowl. 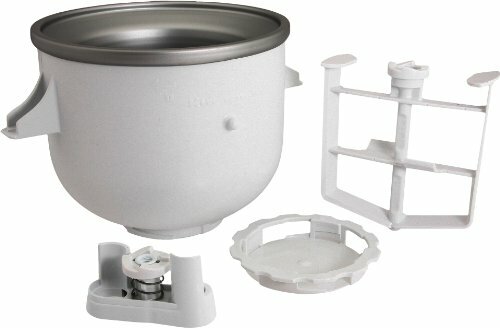 It includes the freezer bowl, dasher, bowl adapter, and drive assembly. All of the parts except the bowl are dishwasher safe, so cleanup is a breeze. 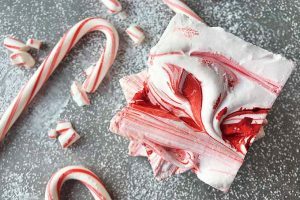 Natural ice cream without all of the gum products and other additives can be made at home with no fuss, with the ice cream maker attachment! 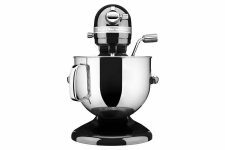 With this ice cream maker, you can make up to two quarts of ice cream, frozen yogurt, or sorbet. Ice cream is one of my fiancé’s and my favorite treats in the summer, but sorbet has become a staple when we’re trying to eat a little lighter. Since it’s usually made simply from just fruit juice and water, with maybe a little natural sweetener, it’s a great low calorie dessert. Just pour your mix into the bowl, and the dasher will do the work for you! 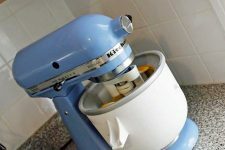 Reviewers report that although this machine can be a bit noisy, it’s quieter in comparison to ice cream makers for stand mixers from other companies. Some reviewers have said that the coolant from the bowl has leaked, but many with this issue had a good experience with customer service, and got a replacement bowl shipped to them promptly. In fact, this attachment comes with a 1-year hassle free warranty. 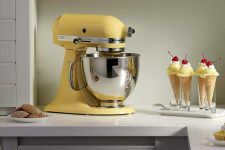 Be sure to select the model that is applicable to your stand mixer; they vary depending on the capacity of your machine (although you can get adapters direct from KitchenAid to switch them between models). See all user reviews of this amazing device on Amazon, or read our full review here. If you’re interested in making pasta at home, you should definitely check out the Pasta Excellence Set. Homemade pasta is infinitely better than store bought, and makes for a fun way to enjoy an otherwise typical meal of spaghetti and meatballs. Make pasta noodles including spaghetti, ravioli, and egg noodles quickly and easily with this accessory! Although you can buy individual pasta cutters, getting the set gives you a lot more variability with your pasta options, and will save you money in the long run! 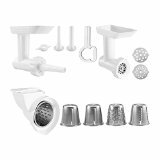 It includes the pasta roller, capellini (angel hair) cutter, lasagnette cutter, fettuccine cutter, spaghetti cutter, and ravioli maker. 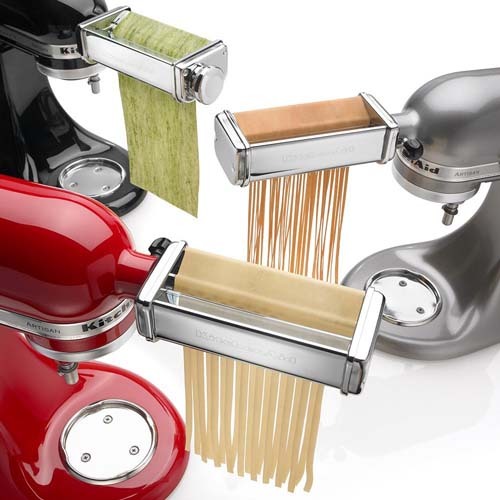 With this many cutters, you can make just about any long pasta you could ever want! 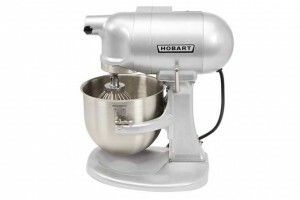 This set is also compatible with any stand mixer from KitchenAid. Just be sure to double-check the model numbers, and you should be good to go. The cutters and roller attach to the power hub on the front of the head of the mixer. The all-metal housing of these cutters ensures lifelong durability. Although the pieces must be hand-washed, brushes are included. 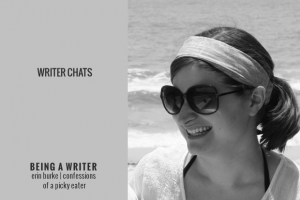 With prompt cleanup, it’s very easy. The set includes a hassle-free replacement warranty, should anything happen to any of the pieces. 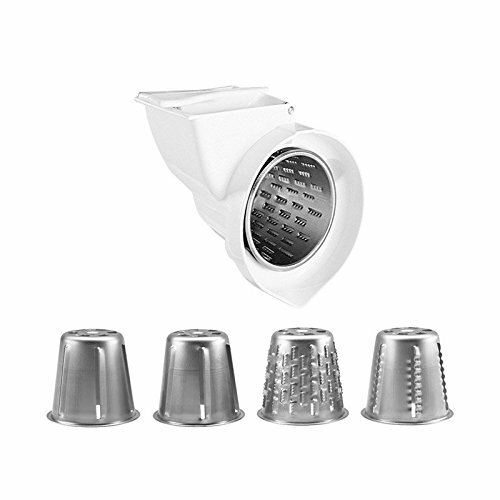 Nearly all reviewers love the pasta cutters and roller, saying they are easy to use and clean, and they make excellent pasta. However, some users struggled to get the ravioli maker to work correctly. Other users countered that with a little practice and using dough that was more dry, the ravioli cutter can produce excellent results. 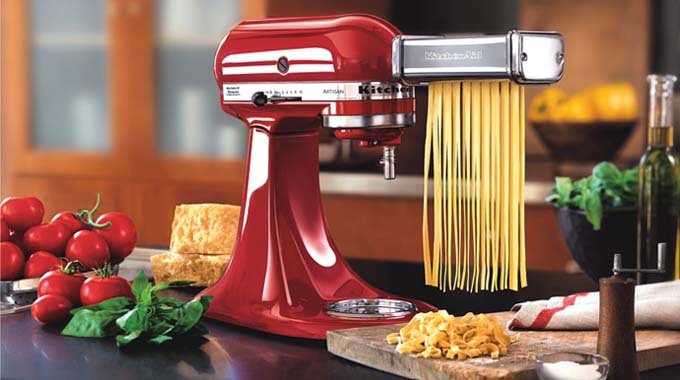 KitchenAid also offers a pasta drying rack with 16 pasta-drying arms, to make life a little easier for you! With this rack, your pasta will dry more quickly than lying it out flat, meaning dinner is on the table that much sooner. It even includes a wand for transporting the pasta from the cutter to the rack. Reviewers say it’s very easy to use and store. Check prices and read more reviews on Amazon now. 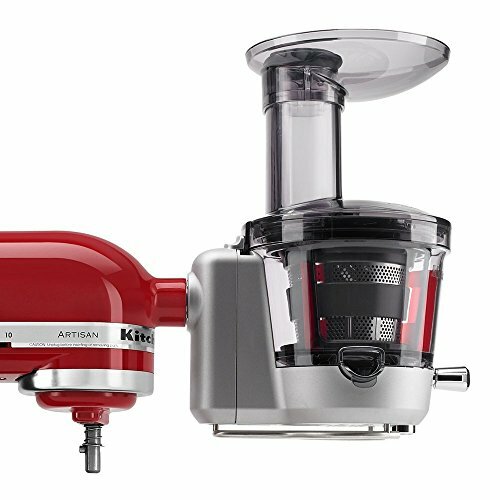 Like the others, the food processor is compatible with all KitchenAid mixers. It attaches to the power hub at the front of the head of the mixer. 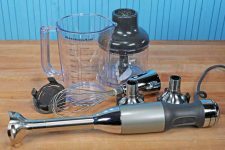 This is a powerful food processor, and a great choice if you don’t have the room to store a food processor base and a standing mixer. This processor can slice, dice, shred, and julienne anything from veggies to cheese. It can even create perfectly uniform cubes! Slicing and dicing is easy with this device! Included with the food processor are a slicing disc, shredding disc, dicing kit, julienne disc, and storage case. With all of these attachments, you can create a veggie tray or dice ingredients for a soup in half the time it would take to do by hand, if that. 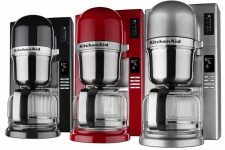 This is a relatively new addition from KitchenAid, and although there aren’t many reviews yet, they are almost entirely positive on Amazon. Reviewers say the food processor is easy to use, works great, and cleans up easily. 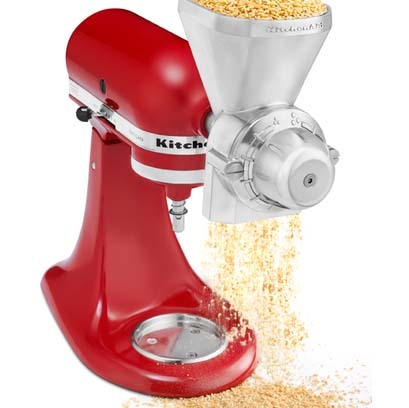 If you are a baker, to begin, I highly recommend going for the KitchenAid 7-Quart Pro Line (for more information on that mixer, check out this article), and second, you need to get this grain mill. If you want to go all out and really, truly make bread from scratch, short of growing your own grain, this is the way to do it! The grinder can produce wholesome whole grain flours for your baking endeavors – just make sure that you have enough mixer to power it! 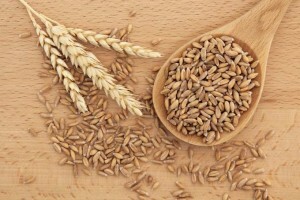 This attachment can grind wheat, oats, corn, rice, and other low-moisture, low-oil grains. It can grind from barely cracked to extra-fine consistencies. With this range, you can make a chunky morning muffin or a fine flour for baguettes, and everything in between. If you have a low-power KitchenAid model, be forewarned that the grain mill really does work the motor. This is ideal for the more powerful models with strong motors. If you plan to mill grain and then immediately bake bread afterwards, you should give the mixer some time to rest before using it to knead the bread dough. As of late, I’ve gotten really into making my own sausage at home. My dad is a hunter, which means I have ready access to a lot of high quality meat. With the grinder kit as well as the optional sausage stuffing tubes, I can do so much more with my bounty! 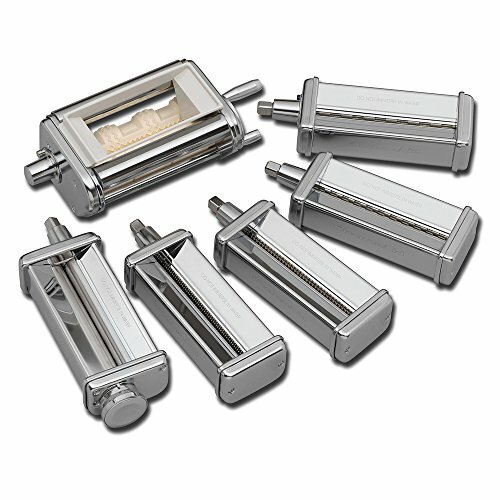 This kit includes the grinder and two sausage-stuffing tubes (3/8 and 5/8 inch). The grinder itself includes coarse and fine grinding plates, a stomper, and a tool to tighten the attachment onto the mixer. What first comes to mind is delicious breakfast sausage, which makes an excellent on-the-go breakfast, but I’m also excited for homemade bratwurst, perfect for fondue night! 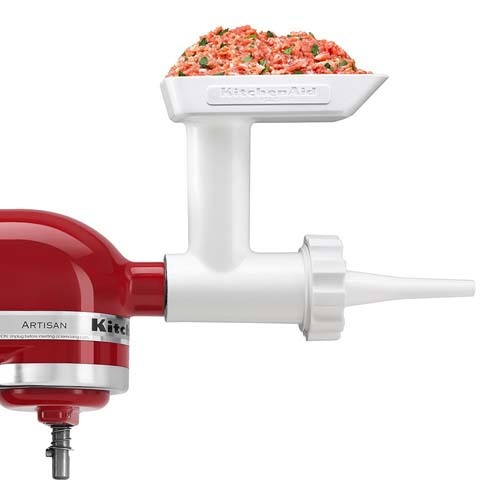 This is no commercial meat grinder, but for the average home cook, it’ll certainly get the job done and is far easier to use than a hand crank grinder. Although all the pieces are dishwasher safe, I’d recommend washing the metal parts by hand and drying them immediately after washing, to make sure you get the most from them. 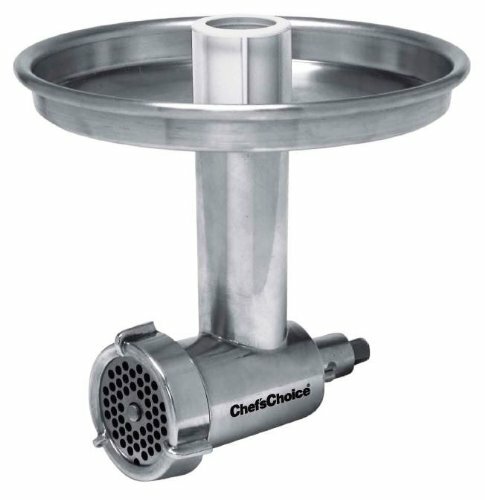 If you’re looking for a stronger and tougher grinder with more capacity and a robust build (all metal), then you can check out the Chef Choice’s Grinder, which also works with all KitchenAid models. With three blade choices and a generous hopper, it can process a lot of venison, beef, pork, and other meats in one go. The KitchenAid sausage stuffing tube will work with this device, but it may require a tad bit of modification to fit them on. With either model, it’s best to have your meat partially frozen before preparing, as it helps to keep the fats and tendons from clogging up the grinding holes. If you’re anything like me, you never feel quite like you truly get the most from juicing a lemon by hand, or even using a stationary juicer. 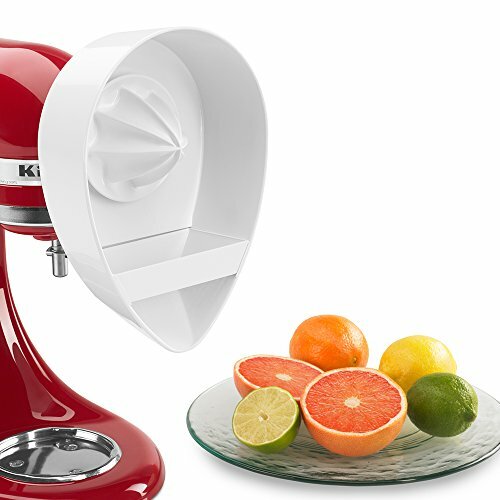 With this citrus juicer, I actually get the full amount my recipes say I should from juicing any citrus fruit! 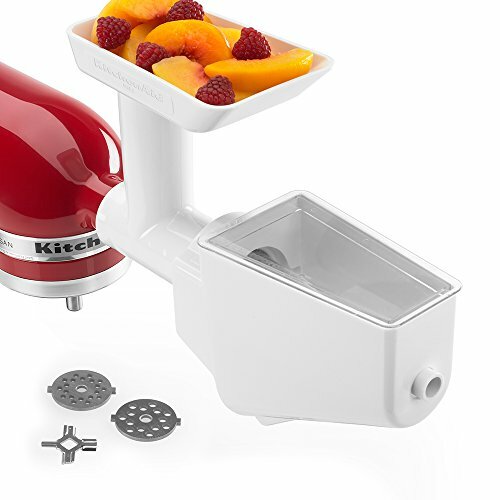 It attaches to the power hub at the front of the machine, and will work for any model of KitchenAid. Included is an attachment for straining the pulp and seeds, so you won’t need to worry about anything chunky getting into your juice. My favorite part: it’s totally dishwasher safe! This fruit and vegetable strainer set is a powerful and multipurpose pack. 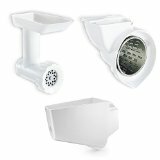 It includes a strainer and a grinder that can also be used to grind cheese, meat, and breadcrumbs. Add any produce and it will not only grind it, but strain out any peels and seeds to leave you with a silky fruit puree. This means you won’t have to spend any time peeling before getting to work! 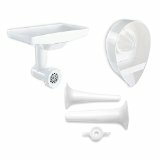 This strainer attachment is great for making baby food, or preparing your ingredients for canning or making jellies. 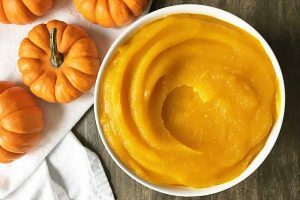 You can use this attachment to make homemade baby food, applesauce, jams and jellies (check out our recipe for peach jam!) and I can’t help but think how great it would be for making sorbet bases for the ice cream maker attachment. Reviewers say this is a must-have tool for canners, and many advise that cooked produce works better in the machine than raw. Since the mixer motor is doing the work for you, you’ll find it’s much easier to use than a hand-crank processor. 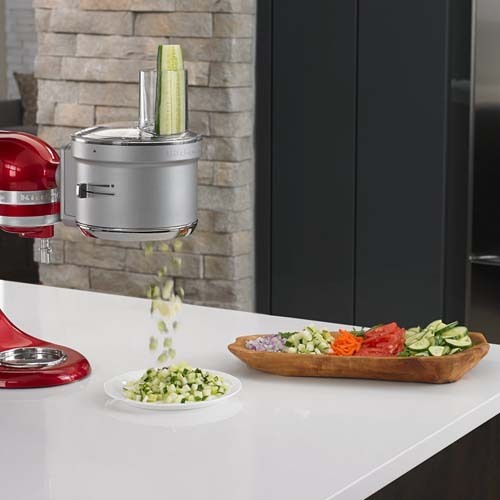 If you like the fruit and vegetable strainer so much that you’ve decided to start juicing, KitchenAid has heard your call. A new addition to their already long line is this Juicer and Sauce attachment. It can handle soft, hard, and leafy produce, and breaks it down by slicing first and then processing. This is a slow, or masticating, juicer. Nutrients are made available quickly and easily from fruits and vegetables with this masticating juicer attachment. If you like some variation in the consistency of your juices and sauces, there are three pulp screens to choose from, ranging from low to high pulp. It features an extra-wide feed tube so most produce will fit without any need for pre-cutting. Like the description says, this is a very slow juicer, which bothers some users. Reviewers who are using a mixer with a more powerful motor had greater success with this attachment. 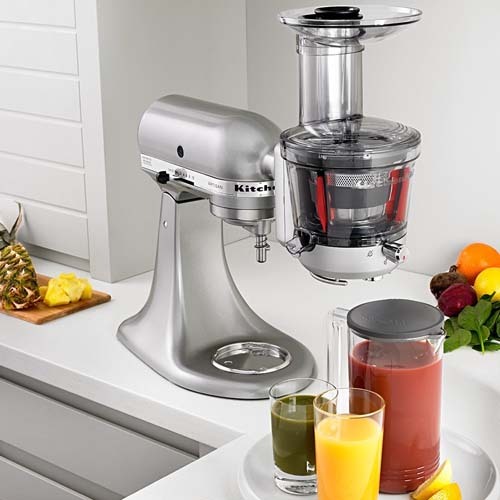 Users say that the many included parts make it a little time consuming to put together and clean, but this is fairly common with juicers, and it is not difficult to use. Read more user reviews now. Until I got this tool, I would buy pre-shredded cheese in bulk and freeze it. I know it’s definitely not the best quality stuff, but it was so convenient to have it already shredded and ready to go. With this attachment, now I can buy much better quality cheese in bulk when it goes on sale, and shred a ton of it without much extra effort on my part. Quickly chop up vegetables and shred cheese with this slicer/shredder attachment. In addition to cheese, you’ll find that the slicer/shredder is a huge timesaver for chopping veggies for stir-fries, shredding carrots and cabbage for coleslaw, shredding all that zucchini from your garden, and anything else you can think of. Reviewers say that, although it does a wonderful job with hard cheeses and produce, softer items like mozzarella don’t quite work. 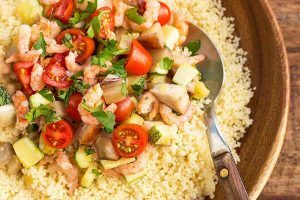 To combat this, try freezing soft foods for a while before shredding. If you want to stock up on your attachments in one go, Amazon offers a few different packs that end up saving you a little money by buying together instead of purchasing each piece individually. 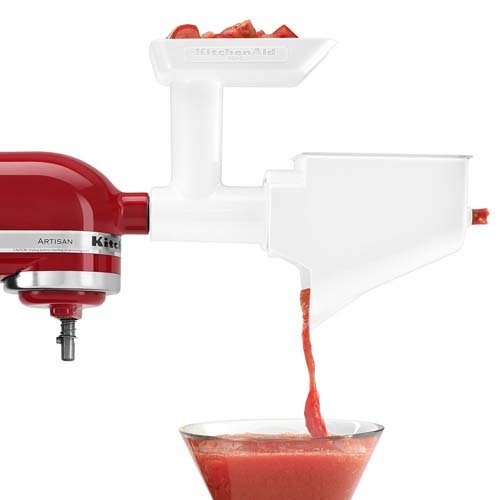 These attachments are compatible with all models of KitchenAid standing mixers. We recommend checking your model numbers before making a purchase, but you should be good to go. 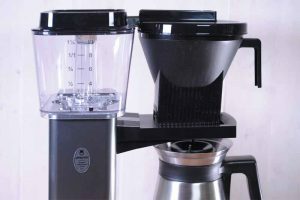 The first one includes the food grinder, slicer/shredder, and fruit and vegetable strainer to give you a lot of variability. 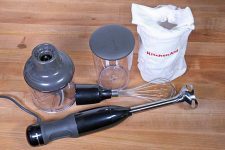 These might be considered the basic attachments offered by KitchenAid, and will absolutely shorten your time spent in the kitchen. Most of the parts are dishwasher safe, to make cleanup nice and easy. With a top rating on Amazon, you can be confident that this is an excellent attachment pack purchase! The second pack available is similar to the first. It includes the food grinder, slicer/shredder, and sausage stuffer. If you plan to buy the sausage stuffing kit, you may just want to go for this pack instead. The slicer/shredder is one of the biggest time savers in my kitchen and it may just be my favorite attachment. See more details now on Amazon. 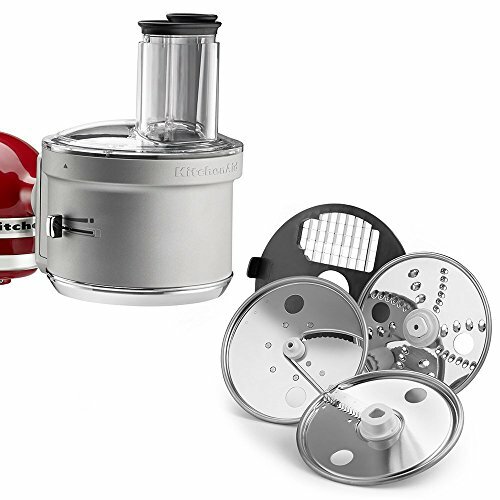 The third pack includes the food grinder, citrus juicer, and sausage stuffer. Again, if you’re going to go for the sausage stuffer kit, you may want to consider this pack, depending on your needs. 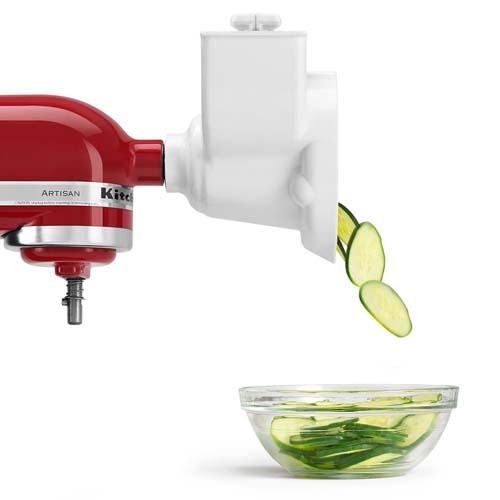 This incredible selection of attachments from KitchenAid can go a long way in rounding out your kitchen, even allowing you to toss or donate some of your counter space-hogging appliances in exchange for a smaller piece that works with your mixer. 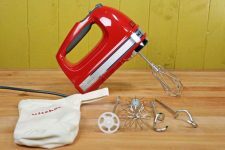 Any of these attachments will make a fun addition to your kitchen and allow you to venture into new from-scratch hobbies, like making ice cream and creating your own sausages. They also make excellent gifts for the holidays, weddings, or housewarming parties! 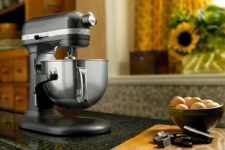 If you’re still deciding which standing mixer to go with, be sure to review our guide to find the best fit for your kitchen. 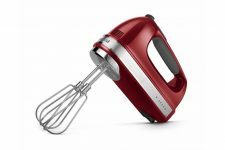 If you plan to use any of these attachments frequently, I highly recommend going with a mixer that has a powerful motor. Tell us all about your culinary adventures in the comments! I’ve always wanted to make homemade pasta and ice cream. I didn’t know I could do both with just one kitchen item and a few attachments. This was an interesting read. I love that all these attachments eliminate the need for many bulky kitchen appliances. This saves counter space, cupboard space, and gets rid of those pesky cords. There is nothing worse than a bunch of cords creating clutter in my kitchen. Thanks for all the information! I love my Kenwood anything!!!! They have lasted for years and they have never let me down. I also enjoy my pasta maker but I cant remember what the make is as it is also old and the plates are a little faded. Very inspiring range of products! It right away made me want to make my own sausages, and ice cream! My SO also decided he wanted to try making pasta, without machine. We will see how that turns out, ha! But yeah, this all looks like good ways to make life easier. I would probably enjoy each and everyone of them! That said, I would never have the place to storage this stuff — and the juicer looks amazing, I love making my own juice (great way to get rid of fruits or carrots about to go bad! ), but it does not look much easier to clean than a regular juicer. I wonder how much noise it makes? My name is Joan & I have a problem: Gadgets. I have so many gadgets it’s ridiculous. Some criticize my gadget decisions but I ignore their concerns. ‘I’m not addicted’, I tell them. ‘I can quit anytime’. I’d love to say I use them all, but I do not. I just like having them handy when a recipe intrigues me & I want to utilize it. So, I guess what I’m trying to say is I don’t have a problem & thanks to reading this I have a few more I am going to pick up! But regardless, I honestly think the only 3 add-on appliance I would buy is the ice cream maker as well as the meat grinder and the pasta maker. 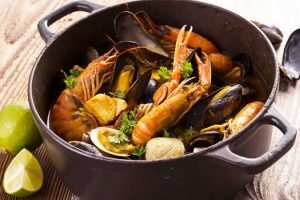 My husband LOVES to make pasta and baked good by hand and he has always wanted to make pasta by hand and from scratch (I would imagine it tastes amazing), and the thought of being able to make ice cream at home is really tempting! Wow, I never knew there were so many attachments. We have been wanting to get the ice-cream maker next but I might want to get the food processor and dicer first. That would make meal prep so much quicker. I definitely need to look into that one. I have only made a few homemade pastas, but perhaps with the pasta roller attachment I would make more. Something to think about for the future. It’s amazing night there are so many attachments for this machine! I got the kitchen aid mixer last year. I don’t have any of the attachments but I love what mixer does. It helps out in shredding meat and mixing ingredients for baking. I definitely would purchase some of these attachments in the future. My two favorite so far are the juicer and sausage maker.